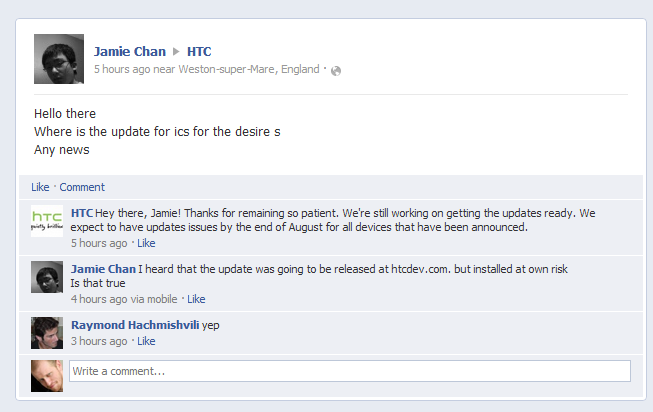 Today on Facebook, HTC took to answering some user comments about ICS timelines for a few of its flagship devices. In particular, the manufacturer confirmed that both the Desire S and the Thunderbolt would be receiving updates to Android 4.0 before the end of this month. The latter in particular is good news, as rumors have been circulating that the Thunderbolt would not receive the upgrade after its similarly-specced sibling, the Desire HD had its frozen dessert plans cancelled. Furthermore, HTC pointed out that all the devices the company has announced an Ice Cream Sandwich update for (read: these) will receive said upgrade by the end August. This is good news for phones like the HTC Rhyme which was scheduled to be bumped to 4.0 by "June-July." That hasn't happened yet, but hold on to that little glimmer of hope, Rhyme-owners! It's nice to see HTC giving some indication of when users can expect updates. Still, these former flagships are only making it to last year's version of Android nearly ten months after its release. Hopefully Google's new Platform Development Kit will help speed things along. Not to mention the fact that Ice Cream Sandwich was reportedly a huge difference from previous versions. Perhaps future rollouts won't take quite so long.